The Cowboys managed to take the Saints down to the wire but the end result was still another loss. And it was a big one in terms of any playoff hopes. The Cowboys didn't have much of a chance before losing to the Saints but there was still a slim chance. But with this loss the best the Cowboys can hope to finish is 8-8. The only realistic shot the Cowboys had was to win the NFC East. But now they are sitting four games back with five games to play. For all practical purposes the playoff hopes are toast. So now the team is playing for pride. There are a lot of guys playing for their jobs right now. Several players along the offensive line may not be back next season. Marc Colombo, Kyle Kosier and Leonard Davis could realistically be sent packing in the offseason. I'm sure not all of them will be gone but I don't think all of them will return. Alan Ball may not be playing for a roster spot but he is playing for a starting job. He has most likely lost any hope of starting next season but if the light suddenly turns on and he starts making plays over the last five games you never know. And Gerald Sensabaugh's contract is up after the season. He has a chance to return since he has played decently but the Cowboys will definitely upgrade at both safety spots if they get the chance this offseason. And David Buehler will be given every opportunity to prove that he is the long term answer at kicker. I have not been impressed but I'm sure the coaches would love to see him find his confidence and start nailing his field goals down the stretch. He seems to have solved his kickoff distance issues so now the field goal accuracy has to improve. Buehler's job is definitely on the line in the last five weeks. And there are more players than I have listed playing for their jobs. But a lot of the veterans will be back next season regardless of their performances over the last five games. So what are they going to play for now? The most important answer to that question is pride. A true competitor gives everything they have each game regardless of what is on the line. You don't have to worry about guys like Keith Brooking or Jason Witten packing it in. What I think is vitally important to play for over the next five games is continuing to establish the changes that Jason Garrett has demanded from the team. Attention to detail and playing with heart and desire will help take the Cowboys into the offseason with some momentum and hope for next season. The offseason is going to be very, very long after a wasted season but a strong finish could give the team a glimmer of hope for next year. For a few brief seconds it appeared that the Cowboys had delivered the knockout blow to the New Orleans Saints. Roy Williams was racing down the field after catching a slant pass from Jon Kitna. Not only was it a first down conversion, but Roy was racing for a gain of 47 yards all the way to the Saints 11 yard line. But then there was suddenly a scrum for the ball after the play. The Saints had stripped the ball from Roy Williams as they tackled him and recovered the ball. Against most quarterbacks that would have been ok. But Drew Brees went into all-pro mode and proceeded to throw three picture perfect passes to quickly take the Saints 89 yards to the game clinching touchdown. The worst play on the drive was a 55 yards pass to Robert Meachem on 3rd and 10. Terence Newman bit on a double move trying to prevent a first down and Meachem raced all the way to the Cowboys 12 yard line. On the one hand you have to be proud of the Dallas Cowboys in this game. They quickly got themselves in a 17-0 hole in the first quarter. Only a few weeks ago this team would have folded and the game would have been an embarrassing blowout. But things have changed under Jason Garrett. Not only did the team battle to keep withing striking distance but they came out on fire in the second half. And the Cowboys really had the game won late in the 4th quarter but the Saints made a play that a Super Bowl winning team makes to win a game. They even had a shot to force overtime although asking David Buehler to hit a 59-yarder was too much to ask of an inconsistent kicker. I'm usually not into moral victories but I have to admit I am still proud of the way my team played. The Cowboys nearly took down the Super Bowl champions without Tony Romo, arguably the best player on the team. And the Cowboys battled back from 17 points down. I am now absolutely convinced that the Cowboys have found their head coach. Jason Garrett found a way at halftime to make adjustments and motivate his players to get back into the game. I seriously doubt we would have seen a comeback like that with Wade Phillips running the show. On offense the Cowboys weren't great against the Saints. Jon Kitna was very inconsistent throughout the game. He had some nice throws but he also missed some easy passes. A lot of people of jumped on the Kitna bandwagon, and he has performed admirably, but the offense misses Tony Romo. I have no doubt that the Cowboys would have won the game on the last drive with Romo at quarterback. For some reason Kitna can't throw the wide receiver screen without getting it batted down or intercepted. Considering that the wide receiver screen is one of the best plays in the Cowboys playbook that is a big problem. And Kitna sometimes checks out of his plays too early allowing the defense to audible to counteract the play change. Don't get me wrong, I'm not blaming Kitna for the loss. I'm just pointing out that the Cowboys do miss Romo more than the box score indicates. The running game still needs a lot of work. The offensive line is not consistently opening running lanes in the middle of the field. I know part of the problem is that defenses don't respect Kitna they way they do Romo so they often crowd eight men in the box, but the Cowboys should be able to run better than they are right now. Felix Jones averaged just 3.4 yards per carry and Marion Barber averaged a pathetic 1.9 yards. I think we need to come to grips with the fact that defense has some major problems. Although they did stop the Saints for a few series in the second half, Drew Brees basically passed at will against the secondary. The pass rush was inconsistent. And when the team needed a big play from the defense after the Roy Williams fumble the defense gave up a touchdown nearly before you could blink. It would have been nice if it would have felt like the Saints at least had to battle down the field to get the game clinching touchdown, but they went 89 yards on just five plays for the score. And even with major flaws on offense, defense and special teams showing up in the game the Cowboys still found themselves with the lead late in the game and with a shot to tie as the clock was winding down. That can only happen if your team is battling for four quarters and doing the little things right. In the end it was still a loss, but you can at least hold your head up high if you wear your Dallas Cowboys gear out in public this weekend. The Cowboys are playing with pride and they are playing with heart. We all remember last year's game between the Cowboys and the Saints. The Cowboys were coming off a two game losing streak and it appeared heading into the game that they wouldn't have Demarcus Ware after he was carted off the field the week before with a neck injury. The Saints were undefeated. No one gave the Cowboys a chance. And all the Cowboys did was dominate the game for three and a half quarters before holding on as the Saints mounted a furious late comeback attempt. In the end the Cowboys won the game 24-17 thanks to a ball control offense and a dominant pass rush. So here were are this season. The Cowboys somehow find themselves with a ridiculous 3-7 record. The Saints aren't undefeated but they are heading into the game on a three game winning streak. The Saints have beaten the Steelers 20-10 and followed that up with dominating wins against Carolina and Seattle by a combined 68-22. The Saints seem to have found their mojo on offense but this time the Cowboys are coming in hot as well. Most people don't give the Cowboys much of a chance to win this game. And they shouldn't based purely on the records of the two teams and the fact that the Cowboys are playing with their backup quarterback. But when the Cowboys pass rushers are on their game they have the perfect antidote for the explosive Saints offense. And Jon Kitna has been surprisingly effective over the last two weeks for the Cowboys on offense. Obviously the Cowboys will need to score a lot of points on offense to win the game. But time of possession will be just as important against the Saints. The best thing, besides score points, that the offense can do is grind out first down after first down to keep the ball out of Drew Brees' hands. Drew Brees is a rhythm player and if the Cowboys can keep the ball away from him it will prevent him from getting in a groove. With that said, I think the pass rush is the key to the game. I know Demarcus Ware will show up. He knows how to find another level for big games. My concern is Anthony Spencer. His pass rush has been nearly non-existant this season. He did have a sack wiped out by an accepted holding penalty last week but he only has three sacks for the entire season. And what makes that worse is the fact that he is seeing one-on-one match ups almost exclusively because the focus is on Demarcus Ware and Jay Ratliff. Anthony Spencer needs to get pressure on the quarterback early and often. If he can establish himself as a pass rushing threat it is going to force the Saints to take their focus off of Demarcus Ware on the other side of the field. That makes the pass rush more effective because Drew Brees won't know where the pressure with come from. It is easy when the quarterback knows that all his has to do is avoid Demarcus Ware. But with pressure from Spencer Brees has no where to turn when Demarcus comes free. The short week leading up to the Thanksgiving game gives the Cowboys an advantage. With only three days of preparation for the game it really hurts the visiting to team to lose time traveling to Dallas. The Saints have a short trip but it still takes valuable hours away from their game preparation time. Any little advantage the Cowboys can get is definitely a good thing. There is really no reason for me to pick the Cowboys to win outside of feeling like they have momentum heading into the game thanks to the leadership of Jason Garrett. I would feel much more confident about the Cowboys winning if Tony Romo were going to be under center. Kitna has played well the last two games but I can't his Jacksonville and Green Bay performances out of my head. Hopefully those games were just a result of him getting the cobwebs worked out after sitting on the bench for so long. My heart wants to pick the Cowboys. But logic tells me to pick the Saints. I'm going to go with my heart for no reason other than the fact that it just feels better to pick the Cowboys to win. I predict a 27-17 win for the Cowboys. Hopefully Anthony Spencer and the rest of the pass rushers will get enough pressure on Drew Brees to help make that happen. The game started for the Cowboys about as well as you could hope. The Cowboys drove right down the field on a 13 play, 98 yard drive for a touchdown to take the lead 7-0 on another great Dez Bryant catch. But then the offense went to sleep. While that was happening the Lions kept grinding out first downs and eventually took the lead while the offense sputtered and handed them the ball in scoring range right before the half. And then the offense even scored for the Lions when Leonard Davis held in the end zone resulting in a safety early in the second half. But then Bryan McCann changed the game. The Lions were forced to punt on their next possession. Dez Bryant was the returner but the punter nailed a great punt that bounced inside the 5 and was batted away from the end zone by a Lions player. McCann smartly scooped up the ball and began racing up field. The Lions seemed stunned as he raced down the sideline and scored giving the Cowboys a 14-12 lead. From that point on it was a new Cowboys team. The Cowboys got the ball back on a fumble recovery after the kickoff and quickly scored again. Although the Lions did score again to pull within 21-19, the Cowboys dominated the rest of the game to win 35-19. It was an amazing turnaround. And I give all the credit to McCann and his blockers on the punt return. Jon Kitna played horribly for about 2 quarters after the great opening drive. Even his screen passes were off target. The offensive line was horrible during the same stretch of the game. The Cowboys were back to getting tackled for a loss on first down running plays. But after the return by McCann the offense was incredible. The line started blocking much better and Kitna started finding open receivers down the field. When the line blocks the Cowboys offense is tough to stop even without Romo at quarterback. There are simply too many weapons to defend. The defensive line did a much better job today getting pressure up the middle. The Cowboys got pressure on Shaun Hill consistently and forced several errant throws in addition to their three sacks. And even though Calvin Johnson did score a touchdown, most of his receptions were for short gains. The defense played much better than last week after they allowed nearly 500 yards of offense against the Giants. So now the talk will start to center around whether the Cowboys can run the table to make it to 9-7. Well, let's see what happens against the Saints and Colts in the next two games before we get carried away. There is certainly momentum building and Jason Garrett has obviously re-energized the the team. I'm just going to enjoy the ride after the awful first half of the season. It has become clear to me that Jason Garrett is the man for the job at head coach. I can't believe this is the same team who lost 45-7 against the Packers just a few weeks ago. They are battling back from adversity and making big plays in key situations. I never thought a head coach could make such a difference but clearly the coaching change has sparked the Cowboys. Maybe the national media will finally wake up this week and realize the head coaching job is Jason Garrett's to lose. Last week was the easy game for the Dallas Cowboys. Maybe not in terms of the opponent but definitely in terms of the motivation to play. The Cowboys had a new coach to play for. They had the world against them. And they had to find a way to show they had a little pride after being humiliated by the Green Bay Packers in a prime time game. This week is different. The Lions are coming to town with their 2-7 record. For some reason the Cowboys are suddenly seen as overwhelming favorites in the game. And the players have a renewed sense of confidence about them. We saw this same scenario play out earlier in the season when the Cowboys pulled themselves together long enough to go embarrass the Houston Texans in their home stadium. But that was the beginning of the end of the Wade Phillips era. After that game the Cowboys proceeded to lose 5 straight games and get progressively worse with each passing week. Can Jason Garrett keep the Cowboys grounded and focused heading into this game? That is probably the most important question about the game. Forget about the X's and O's for a second. If the players are confident, intense and focused the X's and O's will be taken care of. How does Jason Garrett prevent his players from walking into this game overconfident? You would hope that the Cowboys aren't overconfident since they really have no reason to be. They have the same record as the Detroit Lions, 2-7. And they should be reminded of that. And the Lions are 2-7 but they have played nearly every game down to the wire. And the Lions have a lot of individual talent on their roster. Calvin Johnson, Jahvid Best, Ndamukong Suh, and Kyle Vanden Bosch are all top tier players. I believe the embarrassment of this season combined with the renewed focus that Jason Garrett is demanding from his team is going to make the difference. I have been burned so many times by the Cowboys this year it is hard to pick them to win a game with any conviction. But the irrational fan in me wants to believe in Jason Garrett. I am picking the Cowboys to win the game easily 28-13. Last week was the easy week for Jason Garrett. Sure, there was absolute chaos around Valley Ranch for a few days after Wade Phillips was fired and Garrett was named interim head coach. But the players were all ready for a change and they were dying to embrace the renewed accountability and structure that Jason Garrett gave to them. But now that the Cowboys have beaten the "mighty" New York Giants in convincing fashion it has become apparent once again that the Cowboys are actually a talented team. They can beat any team in the NFL when they play good football. But if the team falls back into the trap of relying solely on talent to win games we are going to see the team revert back to the struggles of the first eight games. Jason Garrett has to make sure that the players don't start believing that all of their problems have magically been solved. Watching film of the Giants game should include endless corrections by the coaches. In all honesty, the Giants did not play a good game and they made a lot of careless errors. The Cowboys got away with another sub-par defensive game and an inconsistent offensive performance. And I really don't even need to mention the play of the kicker. Before the Giants game the players all knew there were big problems that needed to be corrected. But the team history this year shows that once the Cowboys win a game they take their foot off the gas pedal and fall back into their relaxed mode. It is up to Jason Garrett to not only keep the pedal to the metal but to actually work the team even harder this week in preparation for the Detroit Lions. The good news is that if Jason Garrett can keep the team moving back in the right direction there is a great opportunity to really establish some momentum with a win against the Lions. But, like Jason Garrett keeps saying, that is only going to happen if they can have a great day of preparation on Wednesday followed by a great Thursday and then a great Friday. I'm becoming a big believer in Jason Garrett but this week will tell us if last week was a mirage or a sign of good things to come. I guess I underestimated Jason Garrett's impact on the team. While I have been impressed by him all week and I was already sold on him as the permanent head coach I didn't think he could do enough to turn the team completely around in one week. I don't know if I've ever been happier to be wrong. It amazes me that the team playing against the Giants was the same team we saw against the Packers last week. The Cowboys played better in every way possible this week. And you could feel the difference in their energy and attitude from the opening kickoff to the last play of the game. It is a shame that it took a wasted season for the team and the owner to realize that things needed to change. But if that gives the team a better shot at a legitimate title run next season then I guess that is what had to happen. Jerry Jones never would have fired Wade Phillips unless the team totally went in the tank. And they did. This week on offense the Cowboys were hitting big play after big play. Dez Bryant is amazing. Every time a deep ball is heading his way I feel confident that he is going to come down with it. He has amazing natural talent. The offensive line was better than they have been all season. The running game was actually pretty decent for a change. And Jon Kitna had time to hit several big passes down the field. And Felix Jones finally looked like the guy from last season again. The defense was still pretty dicey. The Giants moved the ball at will for the most part. But the McCann interception returned 101 yards for a touchdown was huge. And Alan Ball jumping a route to close out the game was awesome. But Alan Ball was still terrible and one play doesn't fool me into believing he should be on the field. The biggest defensive improvement was the run defense. While the run defense wasn't great it was the best it has been all season. On special teams it is becoming obvious that David Buehler just can't get it done as a kicker. He seems to make about 2 out of every 3 kicks but the misses always come at big moments. Hopefully the Cowboys will address that problem in the offseason. Dez Bryant's impact on the return game is huge. The Giants punter was so scared of him he was kicking the ball out of bounds 20 yards short to prevent a return. And Dez nearly broke a kickoff return for a touchdown as well. I hope this is the start of the turnaround we have all been waiting for since the season started. This game only means something if the Cowboys build on their success and start stringing together some wins. Detroit won't be a cake walk next week but they do give the Cowboys a good chance to start a winning streak. Jason Garrett may not have convinced everyone that he should be given the permanent job yet, but I'm sure people are going to start taking him seriously now. And the best part about the win is that is validates the changes he has made. The players that were on the fence about him have to see now that the methods have resulted in success they haven't seen in a long time. I think everyone needs to get their expectations set to a reasonable level heading into the game against the Giants on Sunday. Obviously the Cowboys can win the game if things go their way but I don't think we should expect them to win. It is sad to say but success in this game won't be measured in my eyes by a win or loss. I'll be looking for signs that the Cowboys are turning things around. What does that look like? I think it starts with seeing the players give everything they have for 60 minutes. While I don't think the entire team gave up last week I do think it is safe to say that the players definitely checked out early mentally when things went downhill. Jason Garrett has introduced a fresh approach to the practice week and hopefully it will show up in terms of the mental preparation that seems to have been lacking since Romo went down in the first Giants game. Turning things around also involves the defense breaking out of its funk. It has seemed to me that a lot of the players of gotten away from the game plan and tried to make plays on their own in the last few games. Demarcus Ware has been beaten outside on runs because he has been overpursuing. Anthony Spencer has had similar problems on his side because he keeps jumping to the outside of the tackle at the snap. I think if the players just get back to playing within the system we will see a huge improvement in the performance of the defense. I hope to see the offensive line remember how to run block. How often has the running back been hit behind the line of scrimmage over the last few games? It is completely ridiculous that the offensive line can't consistently block the run better than they have so far. The Cowboys can forget about getting the offense rolling until they get back to running the ball better. What I'll be watching the most is how Jason Garrett runs the team from the sidelines. I was so sick of seeing Wade Phillips stand on the sidelines dumbfounded as the team crumbled around him I was literally sick to my stomach watching him. I hope Garrett is a more commanding leader out there. Little things like throwing the challenge flag with a little conviction or yelling at a guy who makes a stupid mistake set a tone for the team. I want to see him bring some excitement back to the players. He doesn't have to be a cheerleader but I think showing some emotion would help set a better tone for the players. I think the coaching change is at least going to make the last eight games of the season watchable again. I honestly expect Jason Garrett to have the team heading in the right direction by the time the season ends. Who knows, maybe the Cowboys can win a few games late in the season to establish some momentum heading into the offseason. But, for this week at least, I think I would be happy with just seeing the team play like a professional football team again. I'm not picking the Cowboys to win this week but I think the game will be closer than the so called experts would have you believe. It isn't easy to blow out a division opponent because the teams are so familiar with one another. I just don't think the Cowboys can score enough points to beat the Giants without Romo running the offense. I predict a 27-17 loss for the Cowboys. If you haven't watched Jason Garrett's Monday introductory press conference I highly recommend you check it out. You will immediately notice that Jason Garrett has a presence about him that has been missing from the head coach for about three and a half years. Garrett is direct and makes his statements with conviction. He seems like a natural leader. What I like the most about the tone Jason Garrett is setting is the message he has given the team. "Be great today" sums up his philosophy. And if the players really take that message to heart the Cowboys might be able to begin picking up the pieces and get the team moving back in a positive direction before the season ends. Garrett's first practice as a head coach was a practice in full pads. Wade Phillips never held a full pad practice in his entire time as head coach of the Cowboys. Maybe that doesn't mean anything but it does make you realize right away that Jason Garrett is going to make changes and he is going to run the team his way. At practice today Garrett was reportedly yelling at the players to hustle between drills and was constantly stressing tempo during practice. That is a far cry from the laid back approach that Wade Phillips had that allowed the team to slowly unravel this season. And Jason Garrett laid down the law in his first team meeting letting the team know that things are changing right now. I know there isn't any reason to have hope for the playoffs. I have accepted that fact. But I am honestly excited about seeing what Garrett can do with the team. I don't expect immediate results against the Giants this week but I do expect to see a team showing promise for next year by the time the season wraps up. There is something about the way that Garrett talks that makes me believe he is ready to turn this team around. Garrett says the best players will play. I hope that is true. And he says there will be lineup changes but isn't ready to let everyone know what those are yet. I have to believe the changes involve benching Alan Ball. And I hope that anyone who is seen giving less than their best effort will be immediately pulled from the game. I hope the fans that aren't happy with Jason Garrett running the team will give him a shot before they say he can't do the job. It seems like Garrett is was ready to take over and is fully capable of running the team. Give him a chance to show what he can do. The season is a lost cause anyway so if Garrett can turn things around we will be watching the beginning of a new era for the Dallas Cowboys. I was hoping Jerry Jones would make the move after the 2008 season ended in disaster. So I've sat watching the Cowboys for another season and a half knowing the Cowboys were fighting a losing battle with Wade running the show. I was shocked that Jerry didn't fire Wade after the embarrassing showing against the Jaguars last week. But the worst game I have ever watched as a fan of the Dallas Cowboys finally convinced Jerry that the time had come. I know all of the problems with the Dallas Cowboys aren't leaving with Wade Phillips. But something had to be done. Wade didn't show any fire and it seems like his players followed his lead. When the Packers picked up the non-fumble on the kickoff return in the second quarter last night and ran it back for a bogus touchdown I was livid about the missed call. But Wade...he just stood there emotionless as usual. How can he not get angry and at least yell at the officials in that situation? I almost punched a hole in the wall and I'm not a violent person. I really do think Wade Phillips is a very nice man. But he lost his team a long time ago. Like I've said before, I believe the Cowboys won last season in spite of Wade Phillips as opposed to because of him. And the playoff win last season created a mirage that convinced Jerry Jones that things were heading in the right direction. But Wade's laid back approach has allowed a talented, promising team to unravel into the joke of the NFL. So now Jason Garrett gets to try to clean up the mess. And it is fitting that he takes over. Jason has been part of the problem over the last few years. If things have been too lackadaisical with the team approach you have to give Garrett part of the blame. He has had complete control over the offensive side of the ball and the offense has become sloppy and undisciplined slowly but surely over the last two seasons. I'm not saying I don't think Jason Garrett can get the job done. He is very smart and organized. And from what I have witnessed watching him coach in training camp and on Hard Knocks he seems like a hands on guy who will voice his displeasure with his players. Maybe without Wade there Jason will be more willing and able to crack down on the sloppy, undisciplined play. Things certainly can't get any worse. I know a lot of people aren't happy with Jerry's choice for interim head coach. But I think handled it exactly right. If Jason Garrett can't get the job done at least we will find out in a setting where there is nothing to lose. And if he does manage to turn the team around we will know that he is the man for the job. It is the perfect job interview. 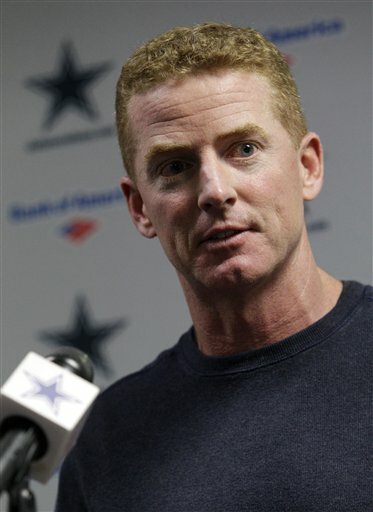 I'm going to hope that Jason Garrett can get the job done. And if he can't we can go after a new coach in the offseason. I'm certainly not expecting an upset win this weekend. In fact, I would be fooling myself if I tried to say I have any realistic expectation of the Cowboys winning the game against the Packers on Sunday night. But that doesn't mean I can't hope. The Cowboys have lost four straight games and the negativity has become demoralizing. I'm sick of the bad jokes being directed at the team and at me specifically. I know one win won't stop that from happening any more this season but it will at least quiet it down. I can't simply throw in the towel and start hoping for the #1 pick in the draft. Giving up is just simply not in my DNA. And I hope the Cowboys players feel the same way. Last week didn't indicate that the players are still trying but maybe they will show some pride this week. Like Roy Williams said, the season isn't completely over until the Cowboys are mathematically eliminated. They still could technically win 9 straight games and make the playoffs. It isn't likely, but there is still a chance. And I won't give up on that tiny glimmer of hope until it is completely gone. With that said, I am still expecting a loss. I think the players will give a better showing this week, but beating the Packers at Green Bay is too much to ask of this team this season. I predict a 27-17 loss for the Cowboys but I hope I am wrong. Over the first few weeks of the season and really, for me, up until the moment I found out that Tony Romo was out with a broken clavicle I still believed the Cowboys were just off to a bad start. Now it has become obvious that there are much bigger problems with the team than just bad luck and untimely penalties. I've been trying to figure out what is wrong with this team since early in the season. It blows my mind that a team can go from a dominating playoff win, an NFC East championship and an 11 win season to what they have become this year. In order for the Cowboys to fall so far so fast there have to be multiple problems with the team and the organization. Here is what I am thinking is the root of the problem. You will notice that the list is long. And you can't pinpoint one specific reason for the downward spiral. 1. Jerry Jones was overconfident in the offseason. He made essentially no moves to fill the obvious holes in the roster at safety, kicker and offensive line depth. I don't know if Jerry was trying to save money or if he really believed that all of his young players were ready to step up but obviously the offseason was a disaster. I don't think you can say that unloading Flozell Adams was a bad move, but just about every other move was suspect. 2. Wade Phillips has lost his effectiveness as a defensive coordinator. It seems as though the opposing teams know exactly what they Cowboys are doing with their defensive schemes. It is almost as if teams have studied the tendencies in Wade's play calling for the last three seasons and now know exactly what is coming. That makes sense since the fans can tell what is going to happen with the defense before the snap just as easily as the opposing quarterback and offensive coordinator. 3. Wade Phillips was never a good head coach to begin with. I truly believe the Cowboys have won in spite of the "leadership" of Wade Phillips over the last three seasons. Now that things are going downhill Wade lacks the skills to motivate his players and turn things around. 4. Jason Garrett's play calling is extremely predictable. Once again, the fans know what is coming as soon as the Cowboys line up. 99% of the time the quarterback calls "kill, kill, kill" the play changes to a run up the middle. And based on down a distance I know about 8 out of 10 times what play will be called. You can get away with that if your offense is dominant, but the Cowboys aren't good enough on the offensive line to succeed when the defense knows what is coming. 5. The offensive line is a disaster. Marc Colombo is obviously playing hurt and it shows. Leonard Davis is either having a terrible season or he is declining in ability rapidly as he ages. Kyle Kosier can't say healthy. Andre Gurode can't seem to adjust his blocking techniques to avoid holding calls now that there is an extra official watching the offensive line from behind. And Doug Free is not a very good run blocker even though he is a very good pass blocker. 6. Miles Austin is having major drop issues. I don't know what is going on with Miles but he is good for a drop or two every game over the last few games. That isn't what we should expect from Miles after he was awarded a huge contract extension. 7. Dez Bryant was hurt in training camp and just recently started practicing regularly. The injuries have drastically limited the offensive impact that Dez could have had early in the season. Dez could have been a difference maker when the season was still salvageable had he been able to practice and learn the offense. It is very apparent that he is going to be a special player for years to come. 8. Martellus Bennett is never going to develop into a dynamic playmaker. I don't know if Marty B. gained weight to help his blocking but it has really hurt his speed and quickness. He looks like just an average tight end now that he looks like he is carrying an extra 15 pounds on his frame. 9. Jason Witten is committing too many penalties. It pains me to criticize Jason because he is my favorite Cowboy of all time. But his false starts are getting ridiculous. He is good for one a game this season. 10. The middle linebackers have both regressed. It seems like the Cowboys kept Keith Brooking for one year too long. Brooking was a good player last year but he seems a little late to react on nearly every play this season. And Bradie James has gone from average to below average. I think these two guys are the main problem with the run defense. Hopefully Sean Lee will help correct this problem but his injuries have slowed his development. 11. Alan Ball is terrible. 12. Orlando Scandrick is awful this season. It appeared early in Scandrick's career that he would develop into a starter. Now he'll be lucky if he isn't flat out released in the offseason. 13. Mike Jenkins has regressed. I think Jenkins still has ability but he has been hit with so many pass interference penalties that he has lost his aggressiveness. Without his intensity and tenacity Jenkins has become a liability in coverage. 14. Anthony Spencer is not playing good football. I don't understand why his habit of jumping around blocks is not being corrected by the coaches. His jump to the outside at the snap is opening up huge running lanes. And Spencer's pass rush has been nearly non-existent. 15. David Beuhler has been inconsistent. I think the Cowboys would have two more wins right now if Beuhler had not missed crucial kicks in the first few games of the season. He may turn out to be a good kicker in the long term but he hurt the team badly while he struggled early on. 16. Tony Romo's turnovers were crippling. I don't think the majority of the interceptions Romo threw were his fault. But the interceptions came at the worst possible moments in the game against the Titans and the Vikings. 17. The special teams punt and kick coverage has been inconsistent. Big kick and punt returns have cost the Cowboys games. Kick returns have been flat out terrible. Maybe they Cowboys should try Dez out there on kick returns. 18. Jay Ratliff is not dominating the middle of the line. In the past Ratliff would split the double team and blow up plays. Now he is getting dominated by double team blocking. His ability to disrupt the middle of the line is the key to the defense. I could continue this list for at least 10 more items if I really wanted to nitpick. I didn't even get into the bad draft picks we've seen over the last few seasons. But I think the point has been made. The Cowboys have a giant mess to clean up. Hopefully they can fix these problems before next season so we don't have to live through another dreadful season. I really don't hate Wade Phillips. He seems like a genuinely nice guy. But he is no longer an effective head coach for the Dallas Cowboys if he ever was at all. I wanted him fired after the 2008 season. I thought he had lost the team at that point. And I still believe they won in spite of him rather than because of him last season. At least the defense was still effective in 2008 and 2009 even if he wasn't doing a good job leading the team. But things are worse now than ever. The defense stinks. The offense can't stop making mistakes. The special teams play is inconsistent. And Wade seems to do nothing to fix the problems that are consistently showing up week to week. And now the team is simply giving up when the chips are down against inferior talent. The Cowboys can't be called anything but a disaster at this point. And Wade is the man leading the downward spiral. I said it last week and it is even more obvious now. This team isn't going to turn things around this year. Romo or no Romo, the Cowboys have too many problems to put together a winning streak that would save the season now. So when Jerry Jones says he wants to keep Wade Phillips through the end of the season because it sets the team back to switch to a new coach now I get very confused. What does Jerry think he is going to save by keeping continuity in the coaching staff now? The season is lost and we can all see it. Things are so bad that some of the knee jerk "fans" are wearing bags on their heads at the game to make their point. While I think the paper bag over your head is a little extreme considering the team won a playoff game last year I think Jerry should see that there is a lot of truth in what his fans are telling him. The team is an embarrassment. And Jerry even admitted as such and apologized to the fans after the game. But then in the next breath he essentially said that things are going to remain status quo for the rest of the season. I just don't understand what that accomplishes. I think he should give Jason Garrett a shot if he really believes that Garrett can still be the next head coach. Paul Pasqualoni has served as a defensive coordinator of a 3-4 defense before so he can take over the defensive play calling. It isn't like Wade has done a stellar job in the last few games running the defense so it couldn't hurt to try something new. It would be a perfect opportunity to give Jason Garrett a test run as head coach with nothing to lose. I don't think that people are asking Jerry to change the coach just to make a change like Jerry talked about after the game. It is painfully obvious that Wade Phillips has lost his ability to lead the team. Wade essentially admitted that fact in his post game press conference. But still Jerry stands defiantly behind his coach. I'm sure the contract extension that Jerry gave to Wade looms large in the current decision making process. Jerry was fooled by the success of last season into thinking that the Cowboys won because of Wade Phillips rather than in spite of him. And now if Jerry fires Wade he'll have to pay out Wade's contract. What I don't think Jerry is considering is how many fans he is losing while he tries to save a buck by waiting until the end of the season. Jerry will lose more money in the long run from his fan base than he is going to save by keeping Wade around. The bottom line is that Wade needs to go. Not at the end of the year. Now. I don't think Jerry is going to actually pull the trigger which is sad. I hope we don't have to see more performances like the Jaguars game to convince Jerry that Wade is no longer effective as the head coach.